By default, Pivotal TC server is configured with a single host named localhost, which allows Pivotal TC server to send resources to clients from the host named localhost. Virtual hosts allows you to configure Pivotal TC server to serve resources to clients from different hostnames. The $CATALINA_HOME/<instance_name>/conf/server.xml file has the host named localhost, which is the defaultHost. 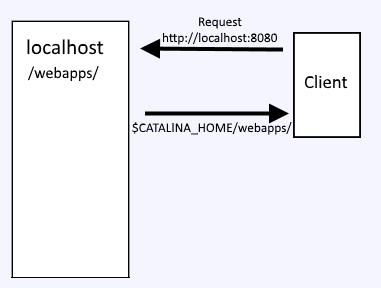 The appBase of localhost is webapps, which means that requests to localhost will serve files at and below the $CATALINA_HOME/<instance_name>/ebapps/ directory. By default, the $CATALINA_HOME/webapps/ROOT/index.jsp file will be served. Additional virtual hosts can be added. As an example, if your domain name is example.com, one possible sub-domain is stage.example.com. 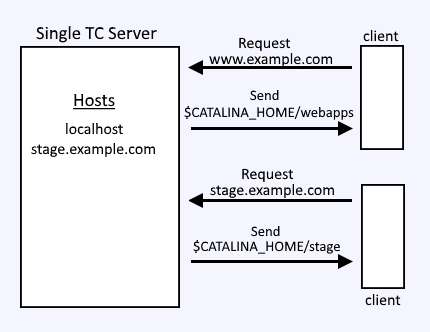 In this scenario, a virtual host named stage.example.com can be added, so that there are now two hosts. Configure your DNS server to resolve stage.example.com to the IP address of your Tomcat server. Since stage.example.com appBase is stage, create the stage directory and the ROOT directory. Add index.jsp to $CATALINA_HOME/stage/ROOT, and then add some text such as Hello World to the index.jsp file. You should also be able to navigate to http://stage.example.com:8080 and the index.jsp file should be served.